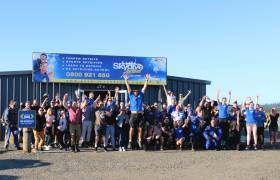 Cancer Society Auckland Northland have partnered with Skydive Auckland again to offer a free skydive experience in exchange for raising a minimum $1000* to provide care, comfort and hope for people going through cancer. We filmed the Alipay Global Shopping Festival Advert here at Skydive Auckland. We held a BBQ and skydive event for over 100 Auckland based booking agents to showcase our awesome dropzone. Great food, drink and sunshine - it could not have been better! The feedback was outstanding with many tourism agents saying it was the best skydive they have ever done in terms of views, the dropzone and the people. Every year we have the pleasure of supporting Taupaki School with their fundraising, by skydiving right into their event just before the fireworks display and bringing a few of the school staff along for the ride. 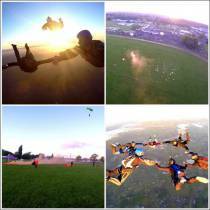 V Energy NZ chose Skydive Auckland to film their recent advert. Yep, we threw a longboard, Xbox and a GS7 out of a plane and challenged Josh to dive after them. Have you got your can ready?